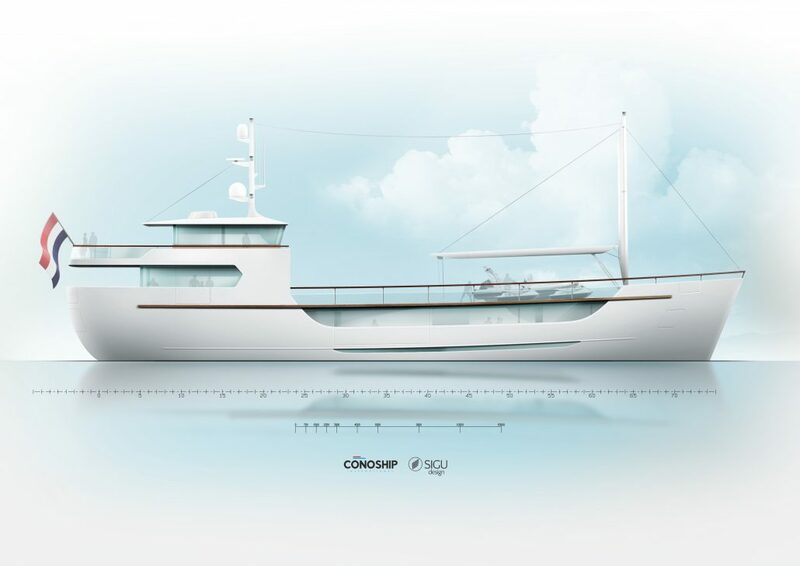 With an elegant and distinctive styling the ConoClassic 50 reminds us of the coasters built in the 50’s bu features all elements of contemporary super yacht and more. Despite its distinctive styling, the 50 features all elements of a contemporary super yacht, and much, much more. The full beam owner’s cabin on main deck offers a panoramic view of the surroundings. The main lounge, also on main deck, baths in sunlight with full height glass walls. The eight guests can be accommodated in four luxurious guest cabins situated in proximity of the main lounge. The outdoor deck area is vast and unsurpassed for a vessel of this size, offering plenty room for outdoor dining, drinks and parties, while offering panoramic views. Further, a wide range of tenders and toys can be stored on deck, well protected by the vessel’s elegant and high bow. Despite its classic looks this yacht features and extensively optimized hull form, a modern propulsion train, and is built according to the latest shipbuilding standards. Its compact size and shallow draft allow access to ports from the Baltic, the Mediterranean, to the Caribbean. Optionally this yacht can be delivered with and Ice or Polar Class notation, making world-wide expedition cruising viable option. By many considered to be the most beautiful ships of last century, the classic Dutch coaster not only was an efficient workhorse, an excellent sea going vessel, but also a well-designed style icon. Pushed into oblivion by a need for a more simple shipbuilding process, she now returns as a Super Yacht, to once again turn heads in every port she docks. Developed by Conoship International, the original designer of many of the classic Dutch Coasters, the Conoship Classic Yachts feature the classic, balanced and stylish lines of the original coasters, combined with the most modern materials and equipment and developed with the newest ship design and shipbuilding tools. 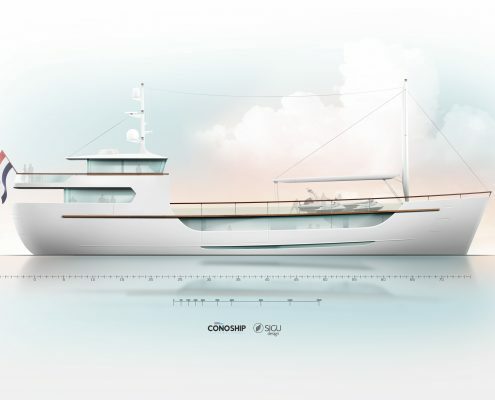 The ConoClassic 50 is the first in the series of Conoship Classic Yachts. The 50 gives you the possibility to go whereever you want, in own your style. The interior layout, equipment and features are adaptable to your wishes and requirements. She will always be ready for new adventures, realizing your dreams.